Cheers to my brother for hooking me up with these 3 Floyds beers. This particular beer’s label is a little too cartoonish for me, but is also gritty and funky on the eye, which I really dig. 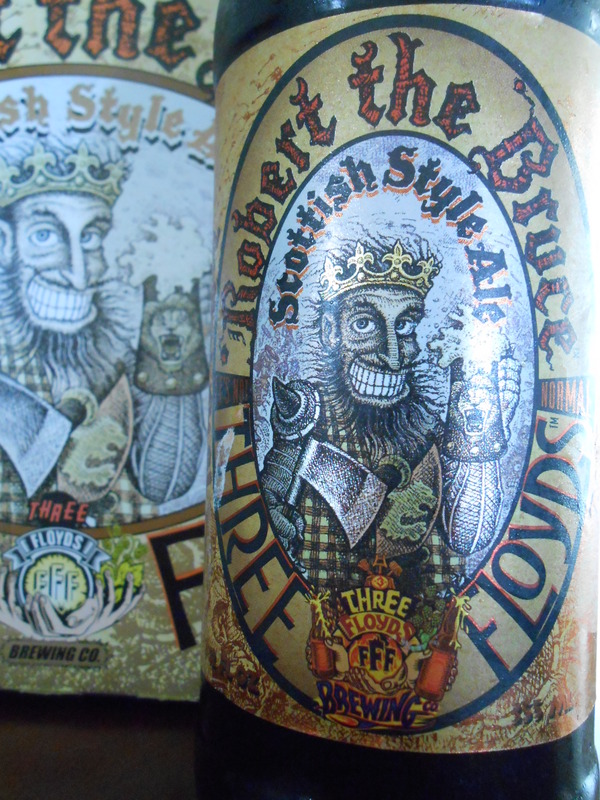 My one complaint is really just the goofy smile of Robert the Bruce, as it gives the beer a cheeky and fake feel that is off with the rest of the label. I love the fonts and they mesh together nicely, allowing the viewer to easily read the label. Clutter is a little tight on the edges and all of the text and graphics do press up against each other, but overall it is not bad. The background is cool and slightly “old map-like” which I like. This label is worthy of scrapbooking or sitting on your shelf to look at for a while. The beer pours a nice dark and syrupy ruby-brown with a little head of miniscule, light tan bubbles that fizzle away to the smallest of rings around the glass. In body, the beer is clean of particles, but dark and a little murky, like looking through a bottle of Aunt Jemima’s syrup. On the nose, the beer smells richly of bready malts. 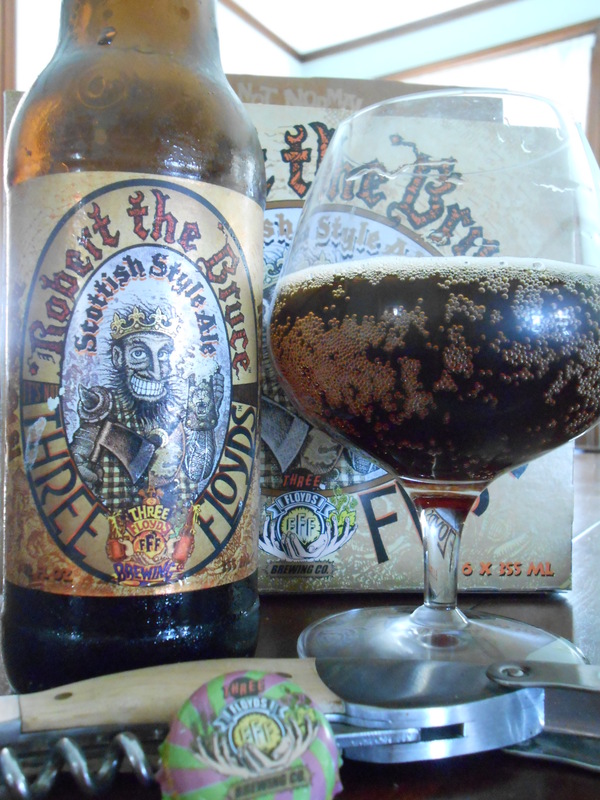 Brown sugar-coated raisins mingle with soft peat smoke and light bacon scents atop the rich, caramel bread smell which gives this beer’s nose a backbone. There is a light touch of sweet alcohol, and definite rich biscuit, chocolate, and bread notes as the beer warms. On the tongue, this beer tastes richly sweet with malts. The beer finds balance through light bitter roast and light savory bacon flavors from the smoked malt. Ever-so-soft herbal hops also gently bitter the tongue beneath all of the other tastes, while slightly cloying alcohol does touch on the middle of the sip. On the tongue, the beer feels medium in body with a lightly chewy, yet velvety mouthfeel and a very soft carbonation and prickle on the tongue. 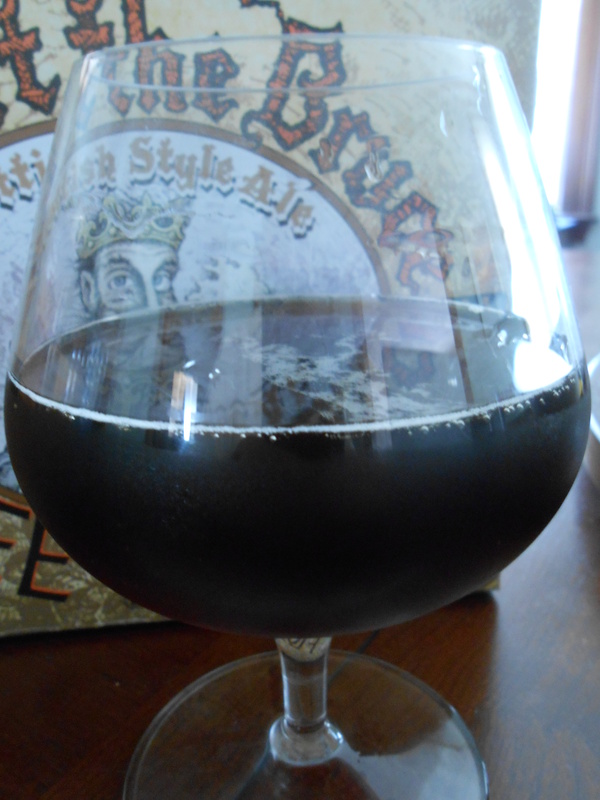 As the beer warms, the mouthfeel seems to thin out a little, which is too bad. The flavor begins as sweet raisins and light bacon and peat smoke, slowly moving slightly towards a cider-like flavor and then swiftly to warm caramel bread with a touch of cola. Faint herbal bitterness can be sensed throughout the sip, and the beer finishes with a nice long touch of bacon-like flavors and a touch of chocolate and bread. The aftertaste lingers with smoke and caramel sweetness while the tongue feels oddly scraped and dry. Slight maple syrup flavors can also be sensed. Overall, this is a nice beer with great malty complexity and a terrific transition of flavor as the beer warms. The closer you get to room temperature the more maple syrup notes you get from the malt, but you also get a touch more the herbal hops. A beer to try for sure.